Last December, our Senator Ron Wyden and Representative Paul Ryan released a plan to reform Medicare that featured vouchers for Medicare enrollees. The document describing their plan uses the terms “premium support” and “coverage support,” but their plan is a voucher plan similar in many ways to the plan that my AFBF Deficit Task Force endorsed. Each senior would be given the option of continuing in traditional Medicare or using their voucher to purchase a health insurance policy from a private company. Private plans would be required to offer at least the basic benefits Medicare now provides. Each year, both participating private insurance companies and traditional Medicare would announce the cost of their coverage for each region of the country. The size of the voucher would be set to equal the cost of the second least expensive plan. After 2022, the growth in the total cost of Medicare would be capped at the growth of GDP plus 1% and it’s possible this cap will limit the growth in the size of the vouchers in future years. I’m an enthusiastic supporter of the Wyden/Ryan Plan for three main reasons. First, switching Medicare to vouchers would finally give Congress direct control over Medicare spending and establish a reasonable limit on the future growth of the program. Under our current fee-for-service Medicare, the government is obligated to pay seniors’ medical bills no matter how rapidly costs increase, and the Congressional Budget Office (CBO) is projecting costs will increase from 3.7% of GDP now to 6.0% in 2037. Even with the retirement of the baby-boomers, Social Security is projected to have a much smaller increase—going from 5.0 % to 6.2% of GDP over the same period. Allowing expenses for senior health care to continue on automatic pilot will cause Medicare to take a steadily increasing share of the federal budget—causing either dangerous federal deficits, higher taxes, and/or the crowding out of defense spending, infrastructure investment, education and other important programs. Like everything else, Medicare needs a budget and the Wyden/Ryan Plan provides one. Second, vouchers will provide seniors with a new powerful incentive to seek out lower cost plans. If they select a plan costing less than their voucher, they keep the difference. If more, the senior will pay the extra out-of-pocket. To gain customers, both traditional Medicare and private insurance companies will be under new pressure to make changes in the way care is delivered to lower costs and improve quality. I believe seniors will accept the needed changes in our current fee-for-service Medicare only if they are given a financial incentive to do so. The Wyden/Ryan Plan provides that incentive. Conservatives argue that allowing competition among private insurance companies will be enough to rein in costs. Liberals base their hopes on government price controls and on panels of experts who will mandate “best practices” and hence reduce ineffective treatments. Both the conservative and liberal approaches have merit. However, I doubt either will be adequate without the new incentives provided by vouchers. Insurance companies have spent many years competing for the business of private companies—with little success in controlling costs. Over the last decade, the cost of private plans has been growing slightly faster than the cost of traditional Medicare. Top-down government price controls and the restrictions in choice that come with “best practices” guidelines will be strongly resisted by both providers and seniors who have become accustomed to getting what they want from fee-for-service medicine. Once the Wyden/Ryan Plan has been implemented, seniors will, for the first time, have a financial incentive to accept a low-cost plan that focuses on effective care and pays doctors for quality, not more procedures. Third, the Wyden/Ryan Plan is a bipartisan plan— something that’s much too rare these days. The urgently needed reforms in Medicare won’t happen without support from both Republicans and Democrats. Senator Wyden and Congressman Ryan deserve our thanks for incorporating good ideas from both the right and the left into a plan that has a chance of eventually being enacted. I’m not surprised this plan came from Senator Wyden and Congressman Ryan since both have a history of working with members of the other party on health care reform—see Wyden/Bennett and Ryan/Rivlin. Another big attraction of the Wyden/Ryan Plan is that it allows both traditional, single-payer Medicare and private insurance companies to compete for seniors’ vouchers in the same market place. Performance, rather than ideology, will then decide the best way to rein in costs. Wide agreement exists that the growth rate of U.S. medical costs must be reduced. One approach often suggested is to introduce more private enterprise into medicine. Hospitals and doctors should be encouraged to disclose their charges upfront, so patients can shop for the lowest cost providers. Health insurance policies should have high deductibles (linked to a health savings account), so patients bear the financial responsibility for their care and have an incentive to look for better deals. Employees and Medicare enrollees should be given vouchers so they can purchase health insurance better tailored to their needs and budgets. Competition among firms in markets normally produces high quality products at reasonable prices. Why not let the market work its magic to solve our medical cost crisis? I support all of the above ideas. More transparency would spotlight the unreasonably high costs of many medical procedures and the wide variation in the charges of different hospitals and doctors. High deductible insurance would discourage unnecessary doctor visits. As anyone who’s looked at this blog knows, I’m a supporter of vouchers. However, as I’ll explain below, I don’t believe these changes are sufficient to rein in health care costs. The way we purchase medical care differs fundamentally from the way most other goods are purchased. Normally, when we go shopping, we start with a clear idea of what we want. When we go to our doctor, we usually don’t know what medical care we need and our doctor’s first job is diagnosing our problem. We learn from our doctor what treatment we should purchase. Doctors have a unique dual role in both recommending and providing treatment. Market competition doesn’t do its normal job of holding down costs when sellers determine the amount of services they provide. I can illustrate this from personal experience. When I was 60 years old, the lab work during my yearly physical showed an abnormally high PSA reading and I was referred to an urologist. He determined I had early stage prostate cancer. I had no symptoms and prostate cancer had never crossed my mind. I had a $5,000 deductible health insurance policy, but I never considered the cost of treatment or shopping for doctors. I wanted my doctor to recommend the most effective treatment and guide me through the options. He insisted I carefully consider both surgery and radiation and I did. However in the end, it was his knowledge and experience that I relied on. For serious (and expensive) medical conditions, we should rely on the expertise of our doctors and follow their treatment advice. The tests and treatments ordered by doctors account for as much as 75% of all medical costs. The best way to reduce these costs is to change doctors’ incentives so they recommend only what clearly has value for their patients. Doctors, not patients, need to be better shoppers. Interestingly, for elective procedures, when patients know the medical treatment they want and don’t need a diagnosis from a doctor, market competition works well to hold down costs. The real cost of elective procedures such as cosmetic or laser eye surgery has been declining. With improvements in computerized diagnostic systems and more medical information on the Internet, patients in the future may be able to diagnose more of their ailments without consulting a doctor. I’m always amazed at how much my wife can learn if I give her a medical question and an hour to surf the Internet. If we ever get to the point that doctors’ main role is providing treatments, medicine will become more like other products and market competition will be more effective in holding down costs. My experience on the AFBF Deficit Task Force in 2009 was a wake up call. I quickly became convinced our country’s biggest long-term problem is rising health care costs. When I first saw the figures, I was amazed. Is our medical system self-destructing and we just haven’t realized it yet? The average total cost of health care for a family of four in the U.S. is now $20,728 and these costs have been rising at more than 8% per year. The average cost of health insurance is now $17,258 with employers on average paying $12,144 and employees paying $5,114. Out-of-pocket costs make up the remainder. Private companies are dropping or reducing health insurance for their employees and state governments are laying off teachers because they can’t afford the yearly increases in premiums. The rapid increase in the predicted federal deficits after 2020 is due mainly to increasing Medicare and Medicaid costs. We need to make big changes, but how? I’ve written previous blogs exploring this topic here, here, here, and here. I recently wrote an OWC chairman’s column for the OregonWheat magazine on Reining in Health Care Costs. In my next two blog posts, I plan to explore further two points from my chairman’s column—why market forces have failed to control costs and why I’m enthusiastic about Wyden-Ryan voucher plan. Today’s NY Times has a column that’s a good lead-in to the first up-coming blogs. 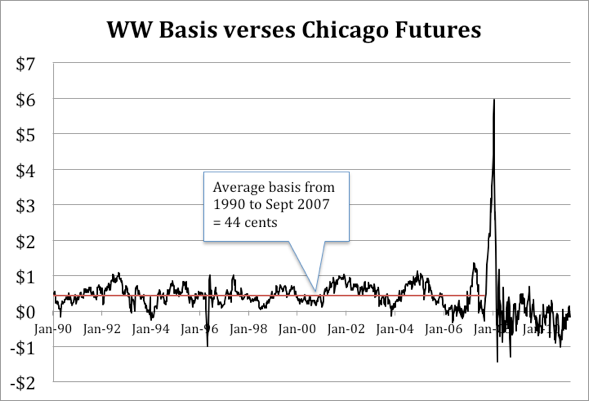 Several months ago, I updated my data on the white wheat basis relative to Chicago futures. I believe the basis graph helps illustrate the effect of the long-only index funds on our basis. The funds became dominant players in the Chicago futures market after 2005, but their early effects were masked by the two back-to-back years of Australian drought. Last summer, my nephew visited us. He recently established a successful website in China used by musicians and other artists to promote their works — so he’s very knowledgeable about websites and blogs. He informed me my website badly needed an appearance upgrade and recommended a hosting switch from using iWeb hosted on the Apple’s me.com site to WordPress. He offered to help and developed what you see here. Making the needed changes would have been much more difficult without him and I greatly appreciate his help. During the last year, I haven’t updated either my old or new sites. My old site was available until Apple closed down its web hosting at the end of June. I’ve had difficulty figuring out how to redirect my domain name “tomccoy.com” to my new site and only accomplished that yesterday. Also, I’ve been chairman of the the Oregon Wheat Commission during the past year and one of my responsibilities has been writing a bi-monthly “Chairman’s Column” for OregonWheat magazine. The columns have given me plenty of opportunity to express my views about current developments in the wheat industry and even about healthcare reform. I will post some of my columns here soon. One of the main reasons I stopped adding blogs during the past year is the death of Raleigh Curtis. Debates with Raleigh stimulated many of my past posts. I miss him. Raleigh’s successor, Jeff Kaser, is doing a great job carrying on Raleigh’s work. However, Jeff’s style is less inflammatory and I haven’t felt the same urge to follow up our discussions at marketing meetings with new blog entries. During the last three months, I’ve been involved with the Columbia Gorge Health Council’s efforts to reform the way Medicaid is delivered in Oregon. We’ve been working to set up a new Coordinated Care Organization (CCO). This may seem a strange activity for a retired wheat farmer. However, the year I spent on the AFBF Deficit Task Force made me a passionate advocate of health care reform. The average total cost of health care for a family of four in the U.S. is now $20,728 with median income just over $60,000. Our health care system is self destructing due to rising costs. I’ll have more to say about this in subsequent posts. Sell wheat early in the marketing year—normally before Thanksgiving—except when the cash price or the basis is unusually low or the carry is usually wide. Use base-price contracts to hedge future crops when the expected return is at least 10% above the long-term average price of $3.90. I describe my rules in more detail in this article. In developing my rules, I was influenced by two articles written by OSU Professor Larry Lev more than twenty years ago (they are still worth reading and are posted under “Wheat Marketing” on this website). 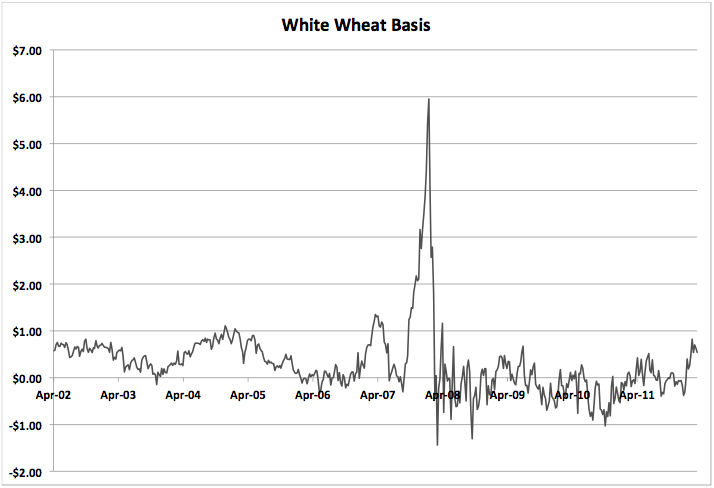 Larry’s approach relies on two characteristics of the white wheat market before September 2007 (see the graphs below). 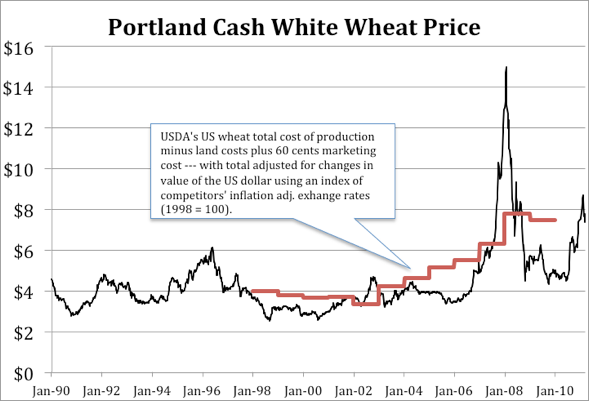 First, the trends in the cash price and white wheat (WW) basis were amazingly flat—prices and basis fluctuated around $3.90 and $.44 respectively for almost thirty years. Second, the price and basis were “mean-reverting,” i.e., within a few months, they usually headed back toward these mean values. Anomalies in the cash price or basis were easy to spot. Larry tested his rules for exploiting anomalies and, on average, they did better than selling every year at harvest. Everything changed after September 2007 when the wheat market finally awoke from its long slumber. 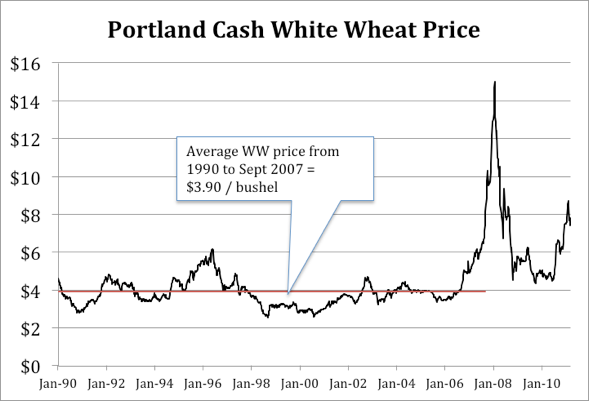 In both 2008 and 2010, wheat prices rose to levels more than twice our wildest dreams just a few years earlier. Both prices and basis also became much more volatile. Partly, this change is due to the growing and now dominant position of the long-only index funds in the Chicago futures market. Notice that our basis has been negative much more often recently. Although the changes starting in 2007 greatly improved my bottom line, they also blew apart my marketing plan and raised many new questions. How do I spot anomalies? How do I know when prices are high or low? How do I forecast where prices are headed later in the marketing year? What is a “normal” level for the WW basis and how can I determine when the basis is unusually low? Even my strongest belief—that wheat should usually be sold early in the fall—is now suspect. The biggest cost of holding wheat is foregone interest income and near zero interest rates have almost eliminated that cost. One way of dealing with this new world is to go back on basic economics. Wheat prices should move toward the world’s average cost of production—at least over a period of several years. If prices are below the cost of production, farmers will shift to other crops, the supply of wheat will increase less rapidly, and prices should rise. If prices are above the cost of production, wheat farming around the world will be profitable, more wheat will be grown, and prices are likely to fall in the future. I don’t know any published estimates of “world average cost of production for wheat.” It would be a complicated calculation since exchange rates are an important factor in determining how the production costs of the major wheat producing countries should be weighted in the average. However, a farmer may be able make a rough prediction about the direction of prices by examining his own bottom line. The same movements in energy, fertilizer, and some other input prices affect wheat farmers around the world. If prices are below an Oregon farmer’s cost of production, holding wheat unsold for a few months longer may be a good gamble. If wheat prices are well above his cost of production, wheat should probably be sold or hedged now. Our retired grain cooperative manager, Raleigh Curtis, has been teaching a marketing approach based on cost of production for many years now. In the current circumstance, I believe Raleigh’s approach makes a lot of sense—especially if cost of production is viewed as a rough predictor of the level toward which prices will tend in the future. My pre-2007 marketing strategy worked because the wheat price and basis trended back toward known benchmarks—$3.90/bushel and $.44/bushel respectively. Can similar benchmarks be calculated in the current situation? Finding good benchmarks will be more difficult because the markets are much more volatile and the new benchmarks won’t be constants as they were before 2007. I’ve calculated a tentative new benchmark for the WW price that might roughly track “world average cost of production.” Each year, the USDA publishes an estimate of the total cost of production for U.S. wheat farms (unfortunately the series starts only in 1998). To test my new approach, I started with this USDA estimate, subtracted their estimate of land costs, and added a 60¢ marketing cost to get the wheat from the farm to Portland. I then adjusted this total for exchange rate changes by using the USDA’s index of our competitors’ inflation adjusted exchange rates. When the U.S. dollar depreciates, the world cost of production should increase relative to the U.S. cost of production and vice versa. My results are plotted on the graph above.